In its August 2009 Mobile Metrics Report released today, advertising firm AdMob highlights the fact that Apple's iPhone OS commanded a 40% share of ad requests on the company's network during the month, up from 33% six months earlier. 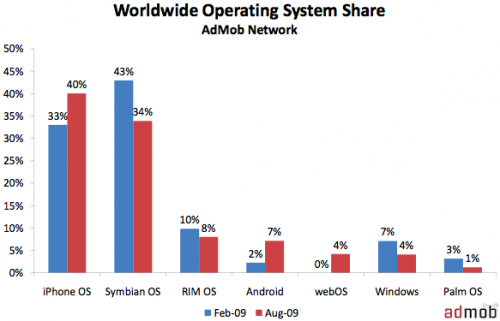 The increase, when paired with a corresponding decrease in market share for Symbian OS, has moved the iPhone OS into the #1 spot for worldwide ad request market share. The study also examined the top smartphone models for ad traffic, where the iPhone ranked first, followed by the HTC Dream. 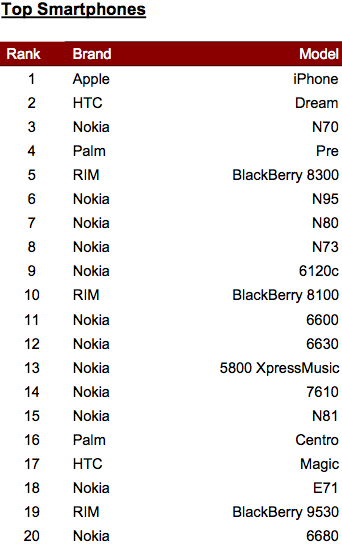 The Palm Pre ranked fourth among smartphones, and worldwide mobile phone leader Nokia held down 12 of the top 20 positions. When all types of "handsets" are included, Apple's iPod touch grabs the second spot behind its iPhone sibling. While not a mobile phone, the iPod touch is included in the survey because it runs the iPhone OS and accesses the same content being served to smartphones and other handsets. AdMob is the world's largest mobile advertising marketplace, serving ads for more than 9,000 mobile Web sites and 3,000 applications worldwide.